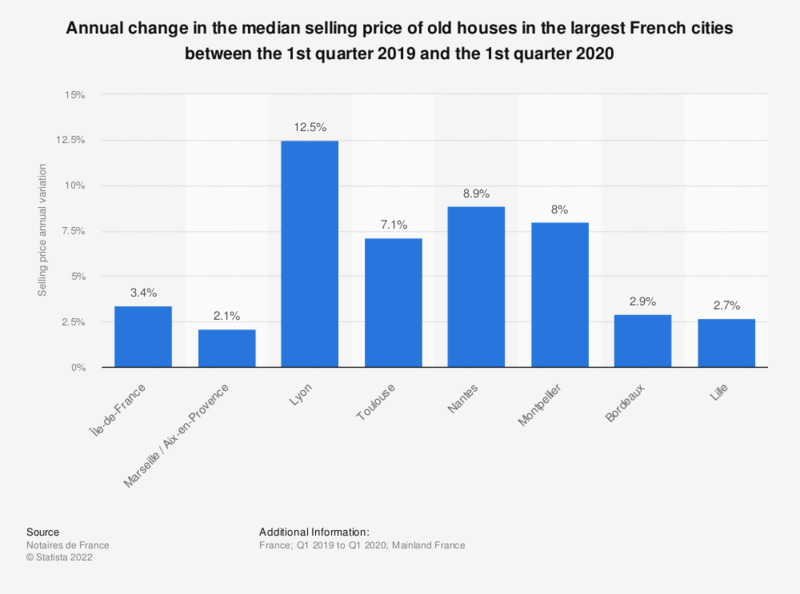 This statistic shows the annual change in the median selling price of old houses in the largest cities in France between the fourth quarter of 2015 and the fourth quarter of 2016. During this period, the sale price of old houses in Bordeaux increased by 7.7 percent. "The median price is such that 50% of transactions have been concluded at a lower price and at a higher price. It represents the "middle" of the market, better than average, more sensitive to extreme values." "Statistics for the houses concern the whole of the agglomeration (city center + suburbs)." "The method of calculating the Notaires-INSEE indices is based on econometric models which break down the price of a dwelling according to its main characteristics (location, size, comfort, etc.) so as to best structural effects that could cause prices to fluctuate from one quarter to the next."